Welcome to Big Timber in Pigeon Forge! 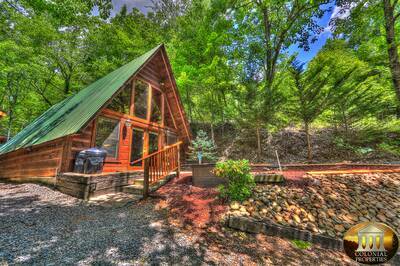 This 3 bedroom, 2.5 bath Smoky Mountain cabin rental offers one of the best locations – only one block from the Parkway! 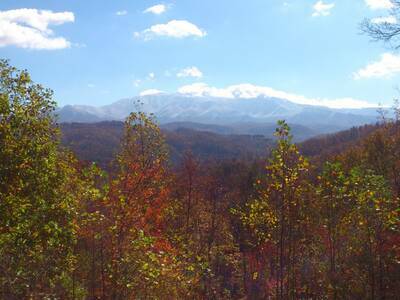 Near all of the great attractions, shopping, dining and theaters of downtown Pigeon Forge! Big Timber is one truly spectacular cabin rental. Built from the finest and largest reclaimed logs available, it is a remarkable showplace. With it’s stunning architectural design and strict attention to detail, there’s not another cabin like it in the Smoky Mountains. Upon entering Big Timber, you’ll immediately notice the massive logs that frame this luxurious vacation cabin getaway. The beautiful, relaxing living area features tree like accents and railings, 2 sofas, recliner and cozy stone accented fireplace. Adjoining the living room is the fully equipped kitchen. Here you can cook and prepare a delicious dinner, mouth watering lunch or yummy breakfast to get your day going. Adjacent to the kitchen is the dining area that accommodates up to six people comfortably. Also located on the main level is a half bath with vestibule sink for added convenience. Take a trip upstairs and you’ll enter the second level - dedicated entirely to the breathtaking master suite. This amazing bedroom features gleaming log and wood accents, cathedral ceiling, 2 person in-room jetted tub and adjoining full bath. Similar to the feeling of being in a treehouse, the master suite is definitely the place to escape to for the ultimate relaxation experience. As you head downstairs, you’ll enter the game room. Here you can challenge someone to a game of foosball or watch your favorite shows on the TV. Off of the game room is second of the three bedrooms. Here you will find gorgeous log bunk beds and a TV for added enjoyment. The third and final bedroom is also located on the lower level at Big Timber. Here you’ll enjoy a queen bed, TV and nearby full bath. At Big Timber, you’ll have the chance to enjoy the great outdoors. The expansive main level deck is accessed from the living room and features massive log construction, additional seating and a super relaxing outdoor hot tub. The lower level outdoor space is patio style and features comfy seating to enjoy the view. In the warmer months, be sure to pack along your bathing suit and pool toys. From Big Timber, you’ll be able to walk over to the resort swimming pool and pavilion. Soak in the sun, read a book or just kick back and watch the little ones go for a swim. Additionally, Big Timber offers complimentary high speed internet access so you can check your email and browse the web while visiting the Smoky Mountains! If you’re searching for a unique, amazing and beautiful place to spend your next Pigeon Forge cabin vacation getaway, then don’t miss out on Big Timber. 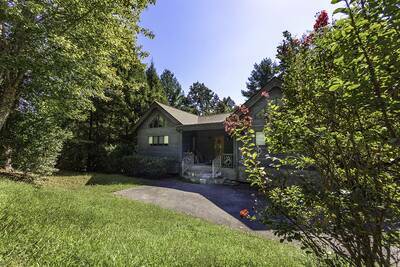 This luxurious 3 bedroom cabin is the place to be! 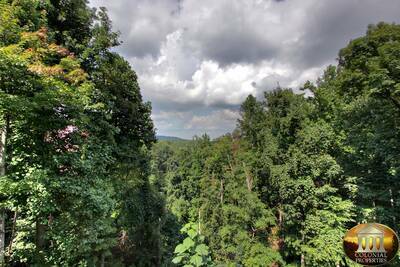 A: The National Park is about 25-30 minutes away with numerous hiking trails available! A: Hi Corey! WiFi is available at Big Timber. A: Hi Alex! Big Timber is not pet friendly. We do have other properties on the program that do allow pets. A: Hi Kim! This is located in Alpine Mountain Village. A: Hi Jennifer! About 5 - 7 minutes depending on traffic. A: Hi Tomeka! No, it's not a high or steep drive to get to this cabin. “ Our rental was more than we expected and was a terrific value for the money! It was very clean and was as nice as the photos depicted on the website. We loved that we were close to Parkway but far enough away to enjoy quiet evenings. We will definitely book with Colonial Properties for our next visit! 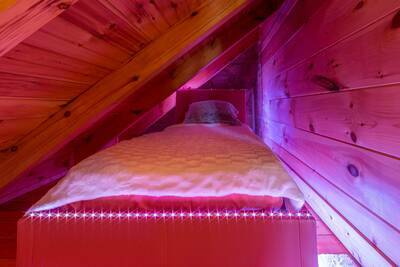 “ My wife and I stayed in this cabin for our honeymoon and we really enjoyed it. I couldn’t say enough about how this company made sure we made it to the cabin,got into the cabin, and checked out. It was clean and very well kept. “ Colonial Properties was more than expected! A friend recommended them and I was very pleased I stayed with them. My family and I will be returning. “ The cabin was great. It had everything we needed. We couldn't get the internet to work. Colonial called to check in with us the first day and said they would send a technician up to look at it. The tech either didn't come or we were doing something wrong because the internet still didn't work. We decided not to call because we could do what little we needed to with our phones. The cabin was very nice and comfortable. “ We absolutely loved our stay. My wife and I used your cabin as a couples get away. We have 5 children and decided last minute to head to the mountains for a weekend together and left the kids with their grandparents. We ventured out a little but mostly stayed inside and enjoyed our cabin. At night we would go sit in the hot tub and chat. Everything felt homie and relaxing. Directly across the street Saturday afternoon my wife noticed a couple turkeys, one of which was a tom. She's never seen a Turkey strut before but the hen had him strutting and gibbling like crazy she thought it was awesome. We took several pictures and enjoyed our entire stay. You guys ensured that all bases were covered for your guest. Thank you so much for making our get away special. “ The cabin was very nice and had great views. Close to the pool which is very nice when you have kids. “ Cabin was very nice and I loved the area. “ The cabin was so clean and beautiful. The view was outstanding, the outdoor space was very relaxing and the outdoor pool was extremely convenient. Everything was so close but seemed so far away when we were at the cabin. We can't wait to get back as soon as possible.